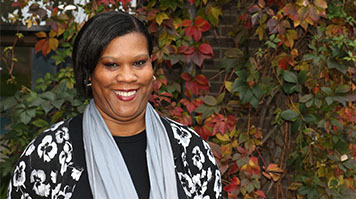 Nursing lecturer Liza Mitchell-Worsfold has won a Mary Seacole award for her work which aims to raise awareness of skin diseases and skin cancer amongst Black and Minority Ethnic (BME) patients who undergo an organ transplant. Liza was presented with the Mary Seacole award at a ceremony in London on the 23 October as one of five nurses who were each provided with grants of up to £12,500 to continue leading projects ranging from focusing on gang work in Westminster to Liza’s own work on raising skin cancer awareness. The Mary Seacole Leadership and Development Awards, named after the renowned 19th century Jamaican-Scottish nursing pioneer, are funded by Health Education England. They are awarded in association with Royal College of Midwives, Royal College of Nursing, Unison and Unite, with support from NHS Employers. Professor Warren Turner, Dean of LSBU’s School of Health and Social Care said: “I am delighted to see that Liza’s efforts to raise awareness of skin cancer and other skin diseases within the BME community are being recognized in this way. “The Mary Seacole award is a fitting acknowledgement of all the hard work she has put into her research." In addition to the money, the winners will undertake a development programme to improve their leadership and presentation skills. Learn more about LSBU's courses on offer in the School of Health and Social Care.